Most folks have seen commercials for trademarked Krazy Glue and Super Glue. Both of these names along with others are becoming generic for cyanoacrylate based adhesives. The original patent for cyanoacrylate was filed in 1942 but the formula has since been sold to different companies and replicated by a variety of manufacturers using slightly different formulations. Cyanoacrylate (CA glue) has amazing strength in surface-to-surface bonding. Beyond everyday repairs, certain types are used for bonding skin for closing lacerations in emergencies and for other surgical procedures. 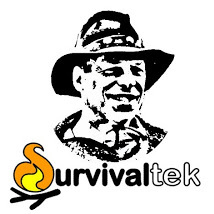 One major factor of the glue’s effectiveness is the amount of surface contact. Originally produced as a liquid, CA glue is now also offered as a gel, enabling it to fill in small gaps in open cracks. Recently I learned about a new application for CA glue that gives it a more third dimensional way for filling in larger gaps and forming better support for small points of contact. Recently I witnessed an auto repairman sprinkle a bit of powder on a broken part in my car then he added a drip of CA glue to it. The powder soaked the CA glue in immediately and in just seconds made a rock hard bond. After doing a little research I found that baking soda can be used as the powder for this kind of bonding so I decided to try it out for myself. I broke apart a plastic beam from some window blinds to experiment with. 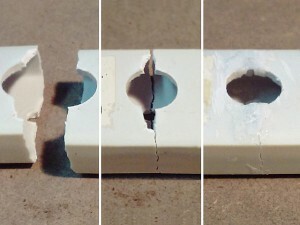 As illustrated by the photo you can see how the two parts were joined and the missing gaps around the hole were filled in using a “build up” technique of successive CA glue applications. I also bridged the cracks inside the hollow beam to add more strength. To my delight the repair was incredibly strong! The application of baking soda in combination to CA glue opens new doors for repairs. The ability to instantly close gaps and build points of support with rock-hard bonds is revolutionary. Caution should be taken when handling CA glue because it can bond your skin (such as your finger tips) together or to another surface. Acetone, often found in nail polish remover can be used as a solvent to loosen and separate bonded skin. This entry was tagged BOB, Emergency, First Aid, Glue, Improvise, Repair. Bookmark the permalink.